Innovators Colin McCrate and Brad Halm met in college after years of working in agriculture and began their Seattle-based sustainable startup back in 2007. Offering customers carefully designed edible landscapes for their city dwellings, Seattle Urban Farm Company filled a growing service sector need, carving out a niche industry that serves a sustainable lifestyle. “I suppose landscaping seemed like the closest thing to farming that you can do in an urban setting—the ornamental aspect of it was engaging but growing crops is what I was passionate about so I combined the two,” says McCrate, who studied agriculture back in Ohio and came to Seattle just as sustainability began making strides into popular culture. Seattle Urban Farm Co or SUFCo meets with Seattle residents, non-profits and private businesses to help them assess their urban agriculture needs. Many people in the city want to grow, explains McCrate but do not have the time or the experience to get started. After the initial consultation period, SUFCo creates detailed scaled drawings of the landscape design. After approval they gather the plants, vegetables and other equipment necessary and go to work in the way any landscaping company would. After the veggies have been planted, the client then has the option of beginning a maintenance plan with SUFCo or looking after the space on their own. To date, SUFCo projects have been a mix of residential and commercial with a lot of homeowners and restaurants taking advantage of their creative skill set. 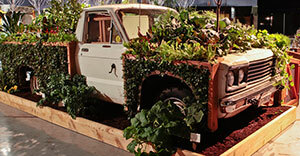 SUFCo team members include urban planners, professional growers, experienced farmers and several landscape architects. The company has grown every year starting from two people in 2007 to an anticipated 14 by this summer. After being in business for so many years, McCrade feels the company has moved past the basic quirky landscaping business to a consultation and design firm, often mistaken for a non-profit. This has hindered their profit margin and the issue of price point for their services. For McCrate, the recent trend towards urban production has helped their company enormously.